There’s this wonderful thing called electricity but if you’re one of the few who still thinks it’s just a fad, you might be interested in using the Pour Mason to make your coffee in the mornings. Of course, this strange little invention could also come in handy during power outages or camping trips, because sometimes electricity isn’t available, even if you know it’s here to stay. Making coffee is fairly straightforward. 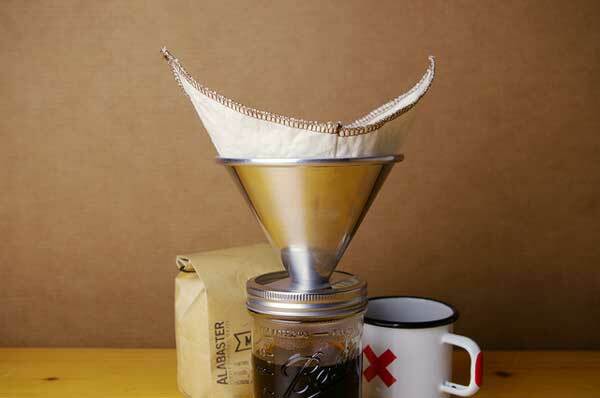 You just take the Pour Mason (basically a screw-on lid with a funnel built into it, screw it on to a Mason jar, place a coffee sock (filter) in the funnel, put coffee in the sock – or filter – and pour water over the coffee grounds. Unfortunately, this rustic device is sold all by its lonesome self. No coffee. No coffee sock. Not even a Mason jar, which seems especially sad since ‘Mason jar’ is probably not on the ‘must-get’ list for most people. Still for only $35, it’s not a bad – Yes, yes it is. It’s a lid with a funnel that doesn’t even come with a jar for the lid. For that price, just go out and get yourself an inexpensive coffee pot. Given all these myopically-named Web sites like “Eater”, “the Daily Meal”, “Serious Eats”, etc. that cover coffee, you’d think they would be eating grounds straight from the can all the time.